This part of the Home Page is dedicated to my grand mother's English family. She was Mary Elaine Alster née Whieldon. Whieldon family of Ipstones, Kingsley, Stoke on Trent and Cheadle in Staffordshire and many other places in England, Australia and USA. Furley Family of Colchester in Essex, London and Broadway and Defford in Worcester. Related to the Furley family: A Sperry / Spyers family of Laverton, Worcester and Marylebone in London. 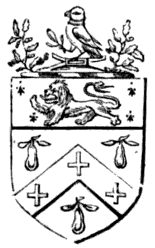 The Whieldon coat of arms as used by George Whieldon of Springfield House, Warwickshire and as shown in Burke's History of Commeners printed in 1836. 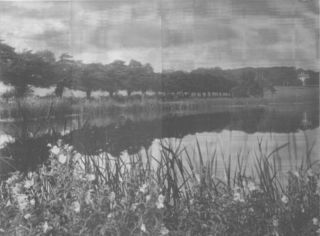 The Whieldon family was first mentioned in Staffordshire in 1579, when one of Henrici Whieldon's children was baptized at Kingsley Church in Staffordshire. By 1582 he had obviously moved to Ipstones in Staffordshire. He most likely by then lived at Blackbrook in that parish. In abt. 1660 one of his descendants bought a piece of land in Ipstones, Staffordshire, England, and built a farm on it, called Blackbrook Farm. This farm was owned by the Whieldons until the 1960ies when it was inherited by three brothers and sisters under age, wherefore it was unfortunately sold. The most famous member of this family was the potter, later High Sherif of Staffordshire, Thomas Whieldon, who was born 1719 and died 1795. He is known as the most competent and the greatest of the last pre-industiral potters in Staffordshire. He had a number of apprientices, counting both Josiah Wedgwood and Josiah Spode. A grand-daughter of the latter married a son of Thomas Whieldon. - Thomas Whieldon's page. Thomas Whieldon bought a number of houses, estates, one was Fenton Hall, an other was Hales Hall, where his widow, Sarah née Turner lived until she died in 1827. He renovated the Fenton Hall and called it Whieldon Hall or Whieldon Grove. This building later became the first railway station building in Fenton. His son the Rev. Edward Whieldon MA was a rector of Burslem and he and his descendants lived here until about 1910 when my great-grandfather had to sell the estate. This page will be developed later. Please e-mail me, if you find any thing of interest on these pages.